While I was checking out at the grocery store last night, I couldn't help but marvel at how inexpensive my veggies were –they were by far the least expensive items in my basket. Fresh fruits and vegetables can be very expensive depending upon what, where, and when you buy them, but they can also be one of the best buys in the market. There are a number of extremely nutritious inexpensive choices that are typically available all year round in most grocery stores. 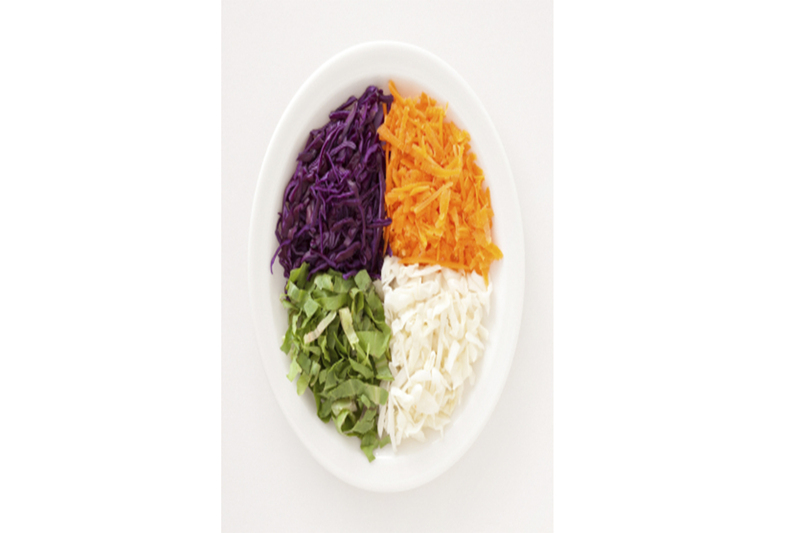 Let's explore two of my favorites – cabbage and carrots. Cabbage is a great source of Vitamin C, Vitamin K, antioxidants, and anti-inflammatory phytochemicals. One cup of shredded cabbage contains about 20 calories and if you eat green, you'll get 47% Daily Value (DV) for Vitamin C and 66% DV for Vitamin K. If you go for red, then the same amount of cabbage will give you 67% DV for Vitamin C and 34% DV for Vitamin K. Savoy cabbage is very similar in nutrients to green cabbage. Green and red cabbage purchased whole is the least expensive way to go, even when you lose up to 20% of the weight by coring and trimming off the outer leaves. Green cabbage is often less expensive than red, and where I live, it goes for about $0.59/lb (3.7 cents/oz) whereas the edible trimmed cost is $0.74/lb (4.6 cents/oz). Red cabbage costs about 6 cents/oz trimmed. So that cup of shredded cabbage (2.5 oz) will cost somewhere between 12.5 cents – 15 cents. Want to try a recipe that got user reviews? Try Cooking Light's Sweet & Sour Baked Cabbage. I can't give carrots enough kudos. This common root vegetable is a Vitamin A superstar! One small peeled carrot contains a whopping 142% DV for Vitamin A (in the form of beta-carotene), 17 calories, and only 4 grams of carbs. Despite their sweet flavor, carrots are not high in sugar and they have a low glycemic load. And that beautiful orange color is also a mighty source of antioxidant power. The least expensive way to purchase raw carrots at the grocery store is to buy a bulk bag of raw, unwashed carrots. A 5 lb bag at my market costs &dollar;2.99/5 lb. An average weight loss with peeling is 15%, so the edible cost is &dollar;0.70/lb or 4.4 cents/oz. So that small carrot only cost me 7 cents since I washed and peeled it myself. The most expensive form of carrot will typically be brand name organic washed/trimmed styles (e.g. Bunny Luv organic shredded carrot) – my store charges &dollar;1.69/10 oz bag (or about 17 cents/edible oz). Small bags of washed and trimmed organic baby carrots are also a bit pricey at 12 cents/oz - nearly triple the price per edible ounce compared to unwashed, unpeeled bulk carrots. Still, you have to decide what your time is worth. For tasty recipes using carrots, check out Eating Well's "Easy Carrot Recipes." If you live in an area where parsnips are available and affordable, then try Cooking Light's "Carrot-Parsnip Soup with Parsnip Chips." In addition to cabbage and carrots, there are other nutritious, low cost veggies to include your recession-proof budget. Stay tuned for more ideas using dark greens, herbs, and other root vegetables! White Fruits & Veggies – Don't Knock ‘Em!